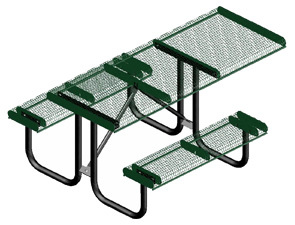 Our 6 ft. Universal Access Picnic Table offers wheelchair accessibility with one extended side. The top and seats are thermoplastic coated 3/4" #9 expanded steel for all weather durability and have rolled edges for added comfort. Available in the colors shown below. Frame is powder-coated. Table top and seats are finished with a lightly textured matte Polyethylene in the color options as shown. Table must be sold with either Surface Mount Clamp or In-ground Mount Post to ensure maximum stability.